After some bleak years, Atlantic City is hoping for a reversal of fortune, with sports betting now legal and two shuttered casinos about to reopen. 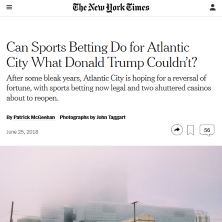 ATLANTIC CITY — The last time there was so much hype about the future of this troubled seaside resort, Donald J. Trump was doing most of the hyping. The president, then a casino impresario, opened the Trump Taj Mahal, the biggest gambling venue on the boardwalk, with great fanfare and at a cost of $1.2 billion in 1990, only to have it collapse into bankruptcy the following year. After years of decline, it shut down in 2016, seemingly consigned to symbolize the ruinous excess here during the Trump era. But now, less than two years later, the old Taj, stripped of its faux minarets, concrete elephants and any evidence of the Trump name, is about to reopen as the Hard Rock Hotel & Casino. On the same day, June 28, another failed casino — the epically disastrous Revel — is being reanimated a short stroll up the boardwalk as the Ocean Resort. These revivals are scheduled just as New Jersey’s casinos scramble to cash in on another way of separating gamblers from their savings: wagering on sporting events. The Borgata casino started taking bets on sports on June 14 and others, including the Ocean Resort, are rushing to install sports books in prominent spots on their casino floors. Adding a popular form of gambling could help draw customers during the dreary winter months. Altogether, it adds up to more opportunity than many people who live and work here could have imagined just a few bleak years ago when five of the city’s 12 casinos failed and a state takeover rescued the city from a bankruptcy filing. Though this once famous gambling mecca still has far to go to reverse its fortunes, some boosters are already painting a rosy picture. New Jersey became the second state — Nevada was the first — with a legal casino when Resorts International opened on the boardwalk in 1978. But a gaming license has not always been a sure thing. In a race to cash in, Mr. Trump and his competitors often borrowed more than they could pay back. At one point, this small city had 13 casinos, three of them controlled by Mr. Trump. But each of his properties fell into bankruptcy and he eventually withdrew from the business. Caesars Entertainment, which still owns three casinos here, had been saddled with about $25 billion in debt before it went into bankruptcy in 2015. Given the city’s record not everyone has been won over by pledges from casino executives and elected officials to make Atlantic City a more family-oriented resort. The same promises have been made for decades, yet the city has remained dependent on gamblers even though it long ago lost its status as the only place in the country that welcomed them outside of Las Vegas. The countryside is now dotted with casinos, including several within a short drive. After Pennsylvania, Delaware, Maryland and New York made casinos legal, those states drained a large share of Atlantic City’s lifeblood. What once was a stream of more than $5 billion in annual revenue has been cut in half and not even the most hopeful investors expect a full rebound. “Do I think the gaming market ever comes back to close to $6 billion in revenue? No. Not even close,” said Jim Allen, the chief executive of Hard Rock International. But still, his company and its local partners, the Jingoli and Morris families, have invested more than half a billion dollars to turn the shuttered Taj Mahal into a resort that emphasizes live music and entertainment. Hard Rock’s read on consumer sentiment is that people are rooting for Atlantic City to succeed but they think that it had “lost its way,” Mr. Allen said.